Coconut Foam Pillow – The Most Popular Coconut Pillows Available, Coconut Bliss Pillow or Kon Tiki Coconut Pillow. 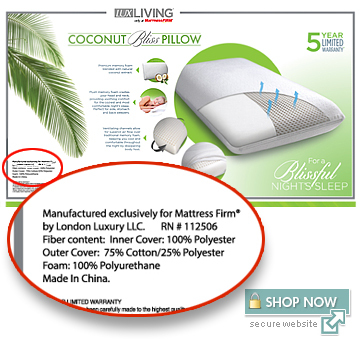 Coconut Bliss Pillow – Manufactured in China by London Luxury LLC. Exclusively for Mattress Firm under the brand name “Lux Living”. The Memory foam core is blended with natural coconut extract, percentage unknown. The Lux Living Coconut Bliss Pillow feels like traditional memory foam. 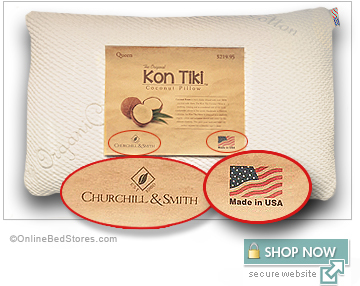 Kon Tiki Coconut Pillow – Manufactured In USA and Italy by Churchill & Smith. The coconut foam core in this pillow is made in Italy and is infused with 30% coconut milk fillers, the outer removable zippered cover is handcrafted in the USA from a blend of organic cotton and polyester stretch knit material for optimum softness and elasticity. The Kon Tiki Coconut Pillow feels like soft latex not traditional memory foam. The Kon Tiki coconut pillow is truly incomparable in feel to other pillows that claim to be made from coconut foam.